Robert Laganiere is a professor at the School of Electrical Engineering and Computer Science of the University of Ottawa. He is also a Faculty member of the VIVA research lab and is the co-author of several scientific publications and patents in content-based video analysis, visual surveillance, object recognition and 3D reconstruction. Robert authored the OpenCV2 Computer Vision Application Programming Cookbook (2011), updated to OpenCV3 in 2017, and co-authored Object Oriented Software Development (2001). 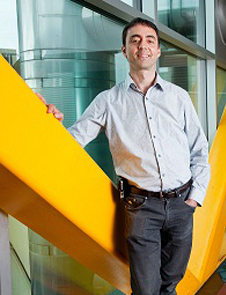 He co-founded Visual Cortek in 2006, an Ottawa-based video analytics startup that was later acquired by iWatchLife in 2009 where he assumed the role of Chief Scientist since 2016. Robert was also Chief Scientist at Cognivue Corp, a leader in embedded vision solutions that was acquired by NXP in 2015. In 2016, Robert founded a new startup company in the field of retail analytics for which is the active CTO. Robert has a Bachelor of Electrical Engineering degree from Ecole Polytechnique in Montreal and M.Sc. and Ph.D. degrees from INRS-Telecommunications, Montreal.